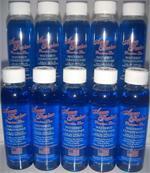 2 pack of 4 oz. 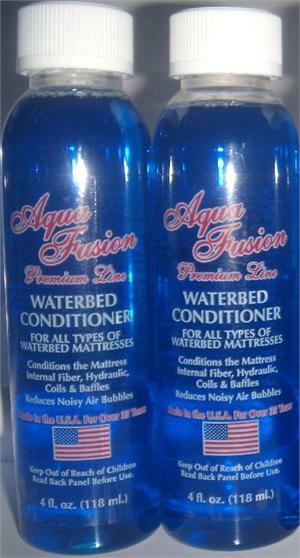 Aqua Fusion Premium Line Waterbed conditioner. 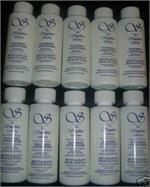 This listing is for 2-4oz Bottles at a low price. 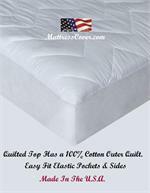 This may be the perfect time to check out our waterbed sheets, mattress pads and pillows. Click below and check out these items that can be shipped right to you at no extra shipping cost! 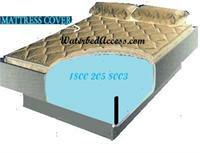 Zipper Cover is for California King Wood Frame Waterbeds. Your heater will turn on less which saves money. Helps Protect the water mattress from punctures. Increases Comfort. Sheets stay In Place Better. Made In The USA Fast Free Shipping included. *Super Breathable and Very soft. *Fits California King wood frame Waterbed Mattresses 72x84. *Organic Cotton outer quilt. *We picked the materials for this cover. *"No one else sells this exact cover". *Easy To install. *Made 100% in the U.S.A..